Each January, roughly one in three Americans resolve to better themselves in some way. A much smaller percentage of people actually make good on those resolutions. While about 75% of people stick to their goals for at least a week, less than half (46%) are still on target six months later, a 2002 study found. It’s hard to keep up the enthusiasm months after you’ve swept up the confetti, but it’s not impossible. The fact that this is perennially among the most popular resolutions suggests just how difficult it is to commit to. But you can succeed if you don’t expect overnight success. Also, plan for bumps in the road. Use a food journal to keep track of what you eat and have a support system in place. Feel like old friends (or family) have fallen by the wayside? It’s good for your health to reconnect with them. If you’ve made mistakes in the past apologize. There is no time better than the New Year for a fresh start. Plus, research suggests people with strong social ties live longer than those who don’t. In a technology-fixated era, it’s never been easier to stay in touch—or rejuvenate your relationship—with friends and family. Fear that you’ve failed too many times to try again? Talk to any ex-smoker, and you’ll see that multiple attempts are often the path to success. Cut back on gym membership costs by exercising at home. Take stock of what you have in the fridge and make a grocery list. Aimless supermarket shopping can lead to poor choices for your diet and wallet. We tend to think our own bliss relies on bettering ourselves, but our happiness also increases when we help others, says Peter Kanaris, PhD, coordinator of public education for the New York State Psychological Association. And guess what? Happiness is good for your health. A 2010 study found that people with positive emotions were about 20% less likely than their gloomier peers to have a heart attack or develop heart disease. Other research suggests that positive emotions can make people more resilient and resourceful. “Someone who makes this sort of resolution is likely to obtain a tremendous personal benefit in the happiness department,” Kanaris says. 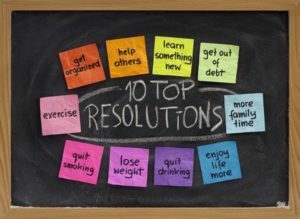 This year, pick one of these worthy resolutions, and stick with it. 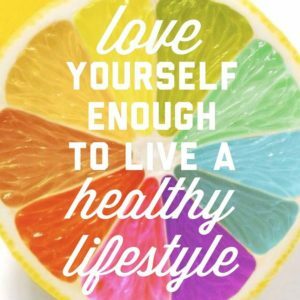 Here’s to your physical health and more importantly mental health!